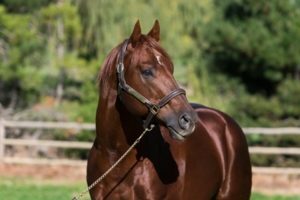 The regally bred Philosophy, a three-parts brother to Lammerskraal Stud’s G1 winner and successful sire Visionaire, made it two wins from just four starts when he scored a gallant win at the Fair Grounds on Sunday. A 3yo colt by Speightstown, the even-money favourite for Sunday’s allowance optional claiming race over five and a half furlongs, pressed the pace down the backstretch, forged to the lead at midstretch and stayed on gamely to win by a head. Philosophy has now won or finished third or fourth in each of his four starts. Scarlet Tango’s other foals include the G1 King’s Bishop Stakes winner Visionaire, and the graded stakes winners Tara’s Tango (G1 Santa Margarita Stakes), Scarlet Strike (G3 Providencia Stakes) and Madison’s Luna (G3 Hutcheson Stakes). Visionaire, South Africa’s Leading First Crop Sire of 2014-2015 and Leading Second Crop Sire the following season, has made his mark in this country through a number of high class stakes winners, notably G1 Wilgerbosdrift SA Fillies Classic winner Takingthepeace, as well as the graded stakes winners Heaps Of Fun, Africa Rising, Royal Pleasure, and The Thinker. The son of Grand Slam has a single lot on March’s Cape Yearling Sale –a filly (Lot 16) bred on very similar lines to G3 Umzimkhulu Handicap winner Winter Magic. venenatis, accumsan sit Lorem felis leo.